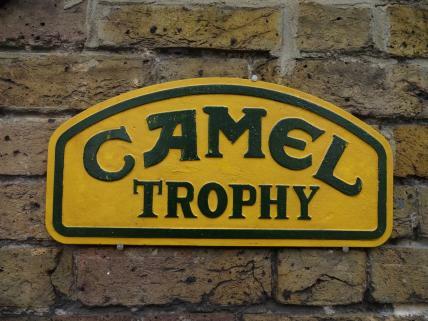 A large domed cast iron plaque featuring the branding from the iconic off-road adventure race, the "Camel Trophy". This sign is perfect for mounting on a garage wall or a vehicle. The Camel Trophy was an adventure race that took place between 1980 and 2000 across some of the most inhospitable terrain on Earth. The Land Rovers that took part in the race were painted in green and sand colour, which is reflected in this commemorative plaque. These signs remind off-road enthusiasts of a time of adventure and challenge - and so they are extremely popular among collectors in 4X4 automobilia.